You’re hot tub isn’t the glorious and relaxing oasis it used to be and is now nothing more than an eyesore. It’s leaking and not heating like it should, so, you think you’re stuck with it. You can deal with an old hot tub by disconnecting and removing it. The biggest problem you’ll have it to get it off your property or out of a foreclosure because you can’t sell it or give it away. Another problem on your hands is the fact that it won’t be easy to disconnect it because it’s backed into a corner. There ought to be enough room for you to get to the water and electrical connections. If you can disconnect the water supply and power supply, that’s nearly half the battle. The good new is, that you don’t have to worry about doing something wrong because it doesn’t work anyway. You should, however, take caution so you don’t accidentally damage your property. That will only cause more work for you, and, cost you money. Disconnect the power supply. Turn off the power supply at the breaker and then remove the panel on the hot tub to disconnect the electrical cord. Disconnect the wiring from the hot tub and then disconnect it from the supply port. Remove the skirt. The skirt is usually connected at the top and along the joints. You can use a drill-driver or screwdriver to unfasten the screws and then pull the skirt away from the hot tub. Take the hot tub apart. Now, you can begin to disassemble the hot tub. This can be a difficult task and might take a few hours to complete. 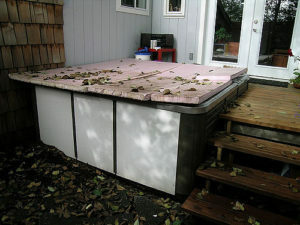 If you need help with getting rid of your old hot tub, just visit Junk Garbage Removal. We’ll lend a helping hand to with our hot tub junk removal service so you don’t have to worry about a thing. Contact us and we’ll send out a crew to get the job done fast. We can also help with things like kitchen soffits and remodeling debris.